John Luther Adams has been hailed by the New Yorker as “one of the most original musical thinkers of the new century.” After studying at the California Institute of the Arts, Adams embarked on a prolific career encompassing a variety of genres and media, including television, film, children’s theater, voice, acoustic instruments, orchestra, and electronics. His Pulitzer Prize and Grammy Award-winning orchestral composition, Become Ocean, has become one of the most popular concert pieces in the modern repertoire. Much of John Luther Adams’ work as a composer and, increasingly, a conceptual artist is rooted in his love of nature combined with what he calls the “resonances” of a particular environment. 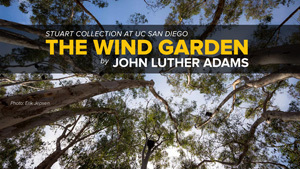 For the Wind Garden, his installation commissioned by the Stuart Collection at UC San Diego, that environment is a eucalyptus grove located in the campus Theater District. Based on a carefully determined site plot, 32 accelerometers were attached to the highest branches, measuring the movements of the trees in the wind. As the velocity of the wind changes so, too, does the amplitude of the sound. Tonal variations and harmonic colors are provided by two virtual “choirs,” a Day Choir tuned to the natural harmonic series, and a Night Choir tuned to the sub-harmonic series. The results are broadcast by 32 small loudspeakers hidden among the trees. Both volume and pitch change in real time throughout the day and with the sun’s movement over the course of the seasons. Because the composition is driven entirely by wind and the sun’s light, it never repeats itself. The listener is surrounded by sounds that vaguely recall bells, voices, strings, and other acoustic instruments, but it’s impossible to describe them in just those familiar terms or to know their exact source. Like some of Adams’ other recent pieces, the Wind Garden has been described as “indeterminate,” but the composer argues that it’s more accurate to call it “self-determining,” not reliant on musicians or conventional instruments. Rather, Adams notes that “the trees are the instruments” while acknowledging the sophisticated technology employed to “give voice” to the trees. Adams hopes that each unique encounter with the Wind Garden and its rich, ever-shifting harmonic palette will encourage both “deep listening” and an enhanced appreciation of the natural environment.